Dr. Dennis Mook-Kanamori’s research identified genes that influence head size and are related to Parkinson’s disease and dementia. 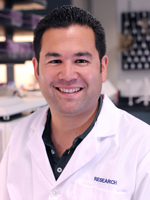 Dr. Mook-Kanamori, was one of the lead authors on the paper that found three new gene variants related to the circumference of a person’s head. One of those genes was also known to be associated with both Parkinson’s and dementia. “We know that the measurement of the circumference of the head is linked to all kinds of cognitive and neurological variability. There are a lot of diseases that come with a large or small head so we were trying to find genes that influence head size, said Dr. Mook-Kanamori. The researchers involved in the study found three genes. The first two were related to adult height but the third one found was also known — from previous research — to be linked to Parkinson’s disease and dementia. At the same time an MRI study was being conducted on intra-cranial volume (also in Nature Genetics this month). Researchers involved with that study, including Dr. Mook-Kanamori, measured the intra-cranial volume of 8,000 people and found one gene associated with it. It was the same gene linked to both head circumference and Parkinson’s. The research sheds new light on what may cause dementia and Parkinson’s disease although Dr. Mook-Kanamori cautioned about jumping to rash conclusions. “This gene only explains less than one percent of the variation in growth, but yes it’s exciting, there’s new biology and if we find what’s going on we could find some new pharmaceutical methods to treat Parkinson’s. The study is the third Dr. Mook-Kanamori has been involved in which has been published in Nature Genetics. He was part of a team led by Dr. Struan F.A. Grant, associate director of the Center for Applied Genomics at The Children’s Hospital of Philadelphia, which discovered two new gene variants that increase the risk of childhood obesity. That research was published online by Nature Genetics at the beginning of April. Dr. Mook-Kanamori said: “This was the first study looking at the genetics of childhood obesity and we found that a lot of the genes involved in adult obesity were also involved with children. However, we also found two new genes that were specifically related to childhood obesity. “They seem to affect the gut although we don’t know for sure. The great thing is that it’s new biology. But Dr. Mook-Kanamori stressed that these genes were not the cause of childhood obesity. “These two genes explain less than one percent of childhood obesity,” he said.